After a couple weeks, several members of my family have had a chance to try out different Mission Athletecare’s EnduraCool Gear to promote Heat Safety Awareness. Living in Georgia, the high temperatures combined with extreme humidity create heat indeces above 100°F. Since my oldest son is in marching band, my husband is training for a triathlon, and I teach group fitness classes, there’s a definite need to stay cool these days. Heat related deaths are an unfortunate reality among all age groups in the South and can be easily preventable. Sadly, not everyone recognizes the signs and symptoms of heat exhaustion that can tragically end lives once heat stroke takes its toll. In my own aerobics classes, I encourage frequent hydration and breaks if people begin to feel overheated. All that being said, I’m presenting this review in hopes that other parents, athletes, and the general public take note of this wonderful new technology designed to keep people cool in harsh weather conditions. I used both the regular and the reflective Techknit towels. Both offer the same cooling technology–cooling to 30° below average body temperature when wet. I found that the reflective towel was more lightweight and stayed cooler longer than the regular towel. What I especially liked about both towels is that they also have UPF 5o protection so my son can use it during marching band rehearsals in addition to sunscreen lotion. My husband tried the reflective fitness multi-cool on a bike ride last week. He wore it under his helmet and said that it was helpful at first but because his hands were restricted on the bicycle, he couldn’t do anything to “reset” the cooling technology. In hindsight, he believes that if he had worn it around his neck, it would have been easier to snap to reactivate the multi-cool once it got warm. I love this headband. While my head shape doesn’t play nicely with headbands–I have to pin them into place–it was fantastic not having sweat roll into my eyes. It’s extremely absorbent like the description implies, and if I had been able to remove it, snap it to cool, I bet it would have worked just as well as the cooling towels. My only vain complaint is that I was sent the Royal Blue Space Dye design and it totally doesn’t match any of my Zumba wear. Truth: I gave the hat to my son during his marching band camp but he forgot to wear it. In the meantime, it’s been sitting around the house. I put it on to take the dog outside to do his business. Since I’ve never really been a hat person, I haven’t used it for working out. I think I’m going to try it this week, though. It is comfortable–I like how lightweight it is. If anything, it’s good for shading the eyes while outside waiting for your dog to decide where he’s going to do his business. 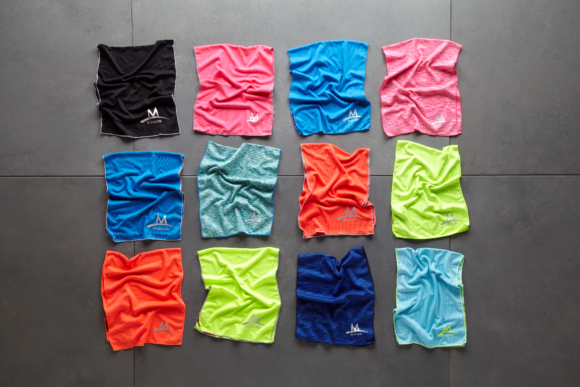 After trying all of these products, I definitely recommend the lightweight reflective towel, the headband, and the multi-cool. I feel so refreshed after my classes now and I look forward to using them on the regular. If you want to learn more about Mission Athletecare’s EnduraCool Gear visit http://www.missionathletecare.com. Disclosure: I received samples of these products from Mission Athetecare in exchange for posting this review.